The war was largely fought on German soil and reduced the country to desolation as hordes of mercenaries, left unpaid by their masters, lived off the land. Rapine, pillage and famine stalked the countryside as armies marched about, plundering towns, villages and farms as they went. ‘We live like animals, eating bark and grass,’ says a pitiful entry in a family Bible from a Swabian village. ‘No one could have imagined that anything like this would happen to us. Many people say that there is no God...’ Wenceslas Hollar recorded devastation in the war zone in engravings of the 1630s and starvation reached such a point in the Rhineland that there were cases of cannibalism. The horror became a way of life and when the war finally ended, the mercenaries and their womenfolk complained that their livelihood was gone. 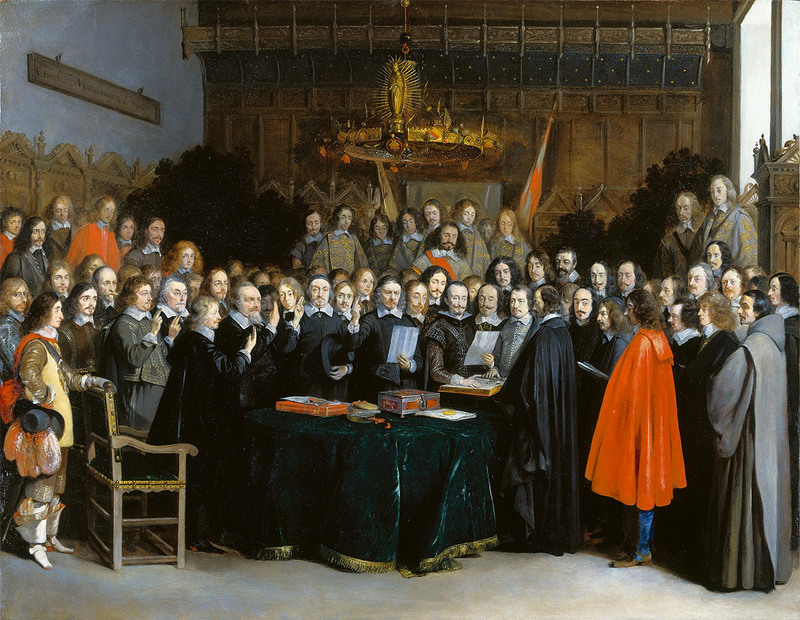 The peace conference to end the war opened in Münster and Osnabrück in December 1644. It involved no fewer than 194 states, from the biggest to the smallest, represented by 179 plenipotentiaries. There were thousands of ancillary diplomats and support staff, who had to be given housing, fed and watered, and they did themselves well for close to four years, despite famine in the country around. Presiding over the conference were the Papal Nuncio, Fabio Chigi (the future Pope Alexander VII), and the Venetian ambassador. The first six months were spent arguing about who was to sit where and who was to go into a room ahead of whom. The principal French and Spanish envoys never managed to meet at all because the correct protocol could not be agreed. A special postal system handled reams of letters between the envoys and their principals at a time when it took ten days or more to send a communication from Münster to Paris or Vienna and twenty days or more to Stockholm or Madrid. Slowly deals were hammered out. Even then it took almost three weeks just to organise the signing ceremony, which commenced at 2pm on the afternoon of Saturday, 24 October 1648.